Home Canada and the Middle East Death of a Palestinian minister: How should Canada respond? 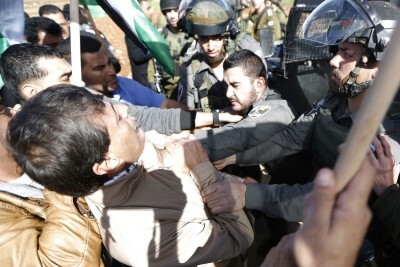 Palestinian Government Minister Ziad Abu Ein scuffles with Israeli police at a demonstration on December 9th a few moments before his death. The demonstrators were trying to plant trees around an illegal Israeli settlement. Imagine for a moment that the picture above had been taken in Ukraine. That the man being throttled had been an unarmed minister in the Ukrainian government. That he had been in a peaceful demonstration opposing Russian occupation of Ukraine. That he had been beaten and teargassed by Russian troops. That he subsequently died. What would have been the reaction of Foreign Minister John Baird? Do you think he would have turned away or shrugged his shoulders? Or would he have been incensed and immediately called for justice? But this is not a hypothetical case. The minister was Palestinian, and he died at the hands of Israeli police. What was Mr. Baird’s response? What should Mr. Baird’s response be? I also sent a copy to opposition leaders. If you agree with me, you might want to write your own letter to Mr. Baird. And copy the other parties as well.